It’s been a year since Billie Flanagan—a beautiful, charismatic Berkeley mom with an enviable life—went on a solo hike in Desolation Wilderness and vanished from the trail. Nobody—only a hiking boot—has ever been found. Billie’s husband and teenage daughter cope with her death the best they can: Jonathan drinks, Olive grows remote. But then Olive starts having waking dreams—or are they hallucinations?—that her mother is still alive. Jonathan worries about Olive’s emotional stability until he starts unearthing secrets from Billie’s past that bring into question everything he thought he knew about his wife. Together, Olive and Jonathan embark on a quest for the truth—about Billie, their family, and the stories we tell ourselves about the people we love. How well do we actually know the ones we love? If they had secrets that came out after their death, would they totally change the way that we looked at that person or would we just shrug and say “That was just like so and so“. Watch Me Disappear explores those questions in-depth. 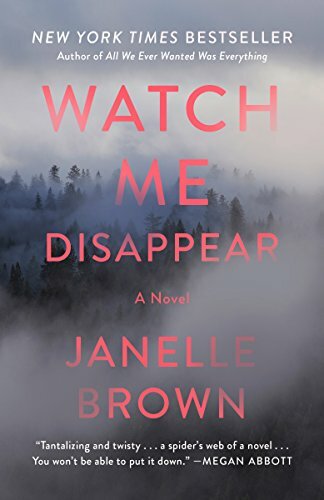 Watch Me Disappear is a very well written book about finding out secrets about your loved ones and how those secrets can change how you see your loved one. While the book got off to a very slow start, it more than made up for the first slowness throughout the book. When you learned one thing about Billie and thought it was over with another secret comes to light. Then with all the issues with Olive and Jonathan were having after Billie’s death, the book was very flushed out. Jonathan, I felt awful for. He was destroyed when Billie went missing on a solo hike. It took him months to even begin to deal with her death. He was struggling to connect with Olive, who had withdrawn after her mother disappeared, and he was struggling to make ends meet. So when his lawyer explained that to legally declare Billie dead, they needed to post an ad in the paper, he wasn’t very happy about it. It was during that time that he found her laptop. It was what he found when he started looking into the laptop that threw him for a loop and made him ask himself this question “Did he even know who Billie was?” The more he found out about her, the more he asked himself that question. He also began to question if she really did die out in the wilderness. Instead, he began to think that maybe, just maybe, she faked her death. Olive, I also felt awful for. Not only did she miss her mother desperately, but she was starting to see visions of her. The first vision that she saw Billie in was at school and caused Olive to walk into the wall. Olive, desperate to find her mother, starts to search alternative methods to explain the visions that she was having. Olive was so sweet and I wanted to cry when she was searching and she was also finding out that her mother was someone who she didn’t know. I wanted to reach through the book and give her a hug. I was not expecting the ending. Sure, I was expecting the 1 year later scene, with Olive and Jonathan happy and successful. But what I wasn’t expecting and it kinda blew my mind. You need to read the book to find out what I am talking about. Why: A solid mystery that had a great plot and good characters. Even the flawed ones you couldn’t help but like. It was. It definitely kept you guessing as to what exactly happened to Billie that day and her secrets just kept coming out until the end of the book.